Since the summer I've been helping my next-door-neighbour-but-one put together a bike specifically for audax, and we gave a lot of thought to what gearing would be best for him. Along the way I started to wonder whether my own choice of gearing (I've been using triples ever since I started back in 2010) was still optimal. I tried a 50/34 compact on a hire bike a few years ago and I knew it didn't suit me, but reading around the subject I came across the concept of "super compact". Most of them don't go low enough for me because they are stuck to 110mm BCD. There are exceptions like the Sugino OX601 & OX901 chainsets - but these are way outside of what current budget permits. For a while I flirted with the idea of an MTB double but somehow the notion of a 4-arm chainset on a road bike seems offensive. Vain? moi? Spa Cycles have their own 'ersatz' super-compact (linky) but it's square taper, something I've moved away from in general, because HTII is significantly lighter. However it got me thinking...why not copy Spa's example and and replace the outer of a second-hand HTII triple with a chainguard? Without an outer ring, the FD should certainly cope with a difference of 16 teeth, and with a slightly wider range on the cassette I could have very nearly the same range of gears I use most on the triple, but without the constant double-shifting which annoys me on a 50-34.
of course you don't really need a chainguard if the limit screws are adjusted correctly. Here's the same combination ready to go on another bike, but using 3.5mm spacers under the heads of the chainring bolts because I was too cheap to go out and buy the short single ring bolts. This might be a really stupid question, but why not just have a triple? The only reason I can think of is that an increasing number of shifters don't support them. Well, I've been an advocate of triples (at least for audax style riding) for a number of years, so it's not obvious. Going back to my brief experience with compact (50-34) I found I was constantly having to double-shift, whereas with a triple I could spend the majority of my time in the middle ring, only changing down to the granny for the steeper hills, and the big ring only downhill or on flatter terrain with a tail-wind. Well, I lost some weight and got a little stronger, and started finding the range of gears available in the middle chainring on the triple to be on the low side - so more double-shifting between middle & big rings, because I'm still not 'man' enough to spend most of my time in a 50 ring. My triple set-up gave me a range from 110" to 23" and I didn't want to lose much of that range (especially not the really low 'winch' at the bottom end). The new set up gives me 106" to 23", so I've lost no important part of the range, much of the overlap & gear duplication is gone, but more importantly front shifting is now much less frequently necessary. 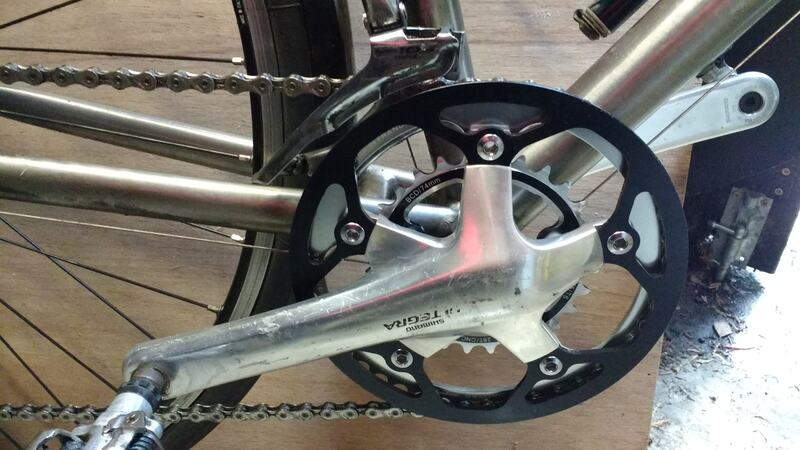 That requires a wider ratio cassette than I'd feel comfortable with. 48/38/26 suits me at the moment, which gives a 27" bottom. I used to run a 42/28 with a 12-32 six-speed block back in the mid-80s. 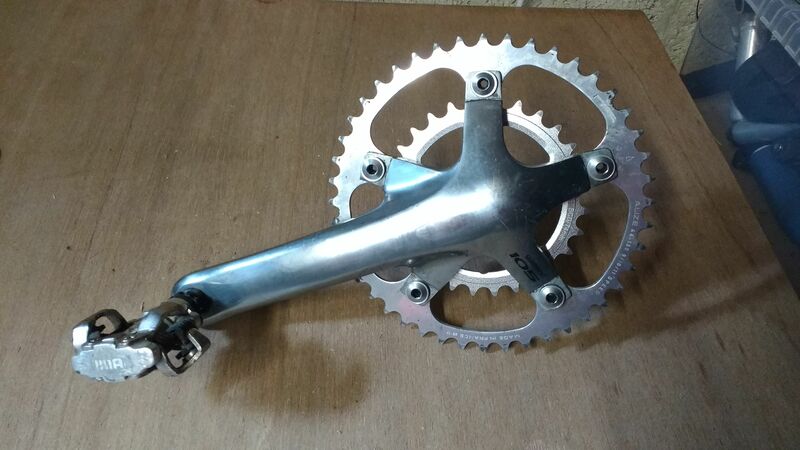 It was a 12-30 cassette (10 speed) before the change from triple, and the game plan was, that if the overall range was OK, ultimately to change to 11 speed so as to keep the cassette gaps small(ish), but the ££ are a little tight at present and so for the moment it's a 10 speed 11-32 cassette and I've not found it too 'gappy'. I guess the occasional trip on 't cog has given me a bit of souplesse too.